Back on the Market. Don't miss the opportunity to own one of the most impressive homes in Ka Makana. Beautifully maintained, resort-like 4-bedroom, 3-bath home with one bedroom and full bath on the main floor. Lush landscaping, private, heated blue tile pool and spa with honu inlay. Outdoor entertaining and BBQ area. Small, private cabana/yoga/reading area overlooking lovely Koi pond. Central AC. Solar water heater and 24 owned PV panels. Beautiful distressed white hardwood flooring on the main floor. Custom Italian tile in entry and entertaining area. Stainless steel appliances. Furnishings may be sold with home if desired. There is no home like this in Hoakalei. 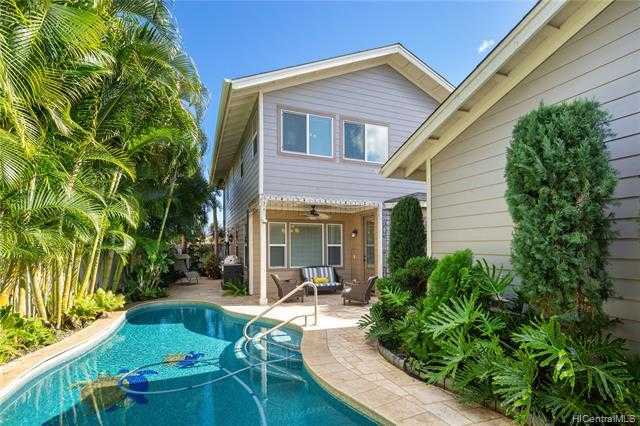 Please, send me more information on this property: MLS# 201903399 – $899,000 – 91-1192 Waipuhia Street, Ewa Beach, HI 96706.